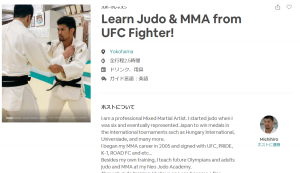 Learn Judo & MMA from UFC Fighter! I am a professional Mixed Martial Artist. I started judo when I was six and eventually represented Japan to win medals in the international tournaments such as Hungary International, Universiade, and many more. I began my MMA career in 2005 and signed with UFC, PRIDE, K-1, ROAD FC and etc… Besides my own training, I teach future Olympians and adults judo and MMA at my Neo Judo Academy. Through Judo training, I believe one can become a fine person who is strong both physically and mentally and importantly, willing to contribute to the society. Let’s learn judo! Copyright © 2016 NEO JUDO ACADEMY. All Rights Reserved.